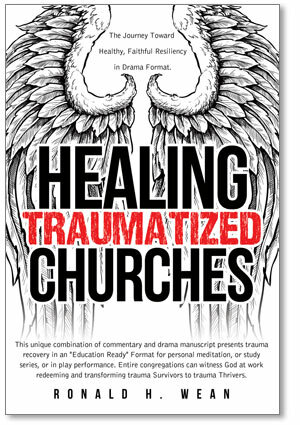 Within the pages of Ronald H. Wean’s new book, Healing Traumatized Churches: The Journey Toward Healthy, Faithful Resiliency in Drama Format, readers are sure to find a refreshing twist on a serious issue taking place in many churches. The essence of the book is that through the trauma of the Cross, our trauma is transformed into blessings. That healing transformation in ourselves and our churches is our witness for God’s intention to a traumatized world. Wean has uniquely presented this transforming journey in a readable, education ready 3 Act Drama so that congregations not only have a window to see the healing story unfold, but also a mirror to begin those transforming conversations toward safe, healthy, and faithful congregations.